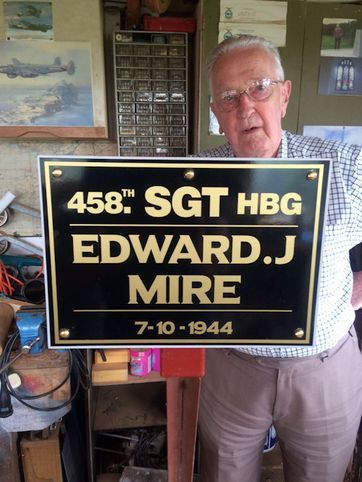 The Grice crew was assigned to the 458th in mid-August 1944. After a short indoctrination into the theater, the crew began combat flying at the beginning of September. Their first mission on September 1st ended up being for no credit as the group was forced to abandon its efforts due to weather over the continent. The crew’s first credited mission was on September 5th to the marshaling yards at Karlsrhue, and was followed over the next week by three more missions to Germany. In mid-September the 458th came off of combat operations and were tasked with delivering gasoline to Patton’s Army in France. Grice and select crew members participated in ten of these “Truckin’ Missions”, until the end of the month. 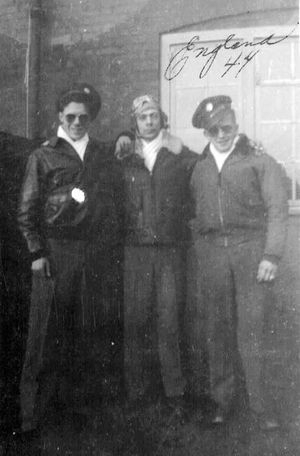 Over the next five months, Grice and crew put in their remaining missions, a number of them some of the roughest the group would see during this period: Schoenecken, Harburg, Magdeburg, Peine-Hildesheim, and the group’s 200th mission on February 26, 1945 to Berlin. 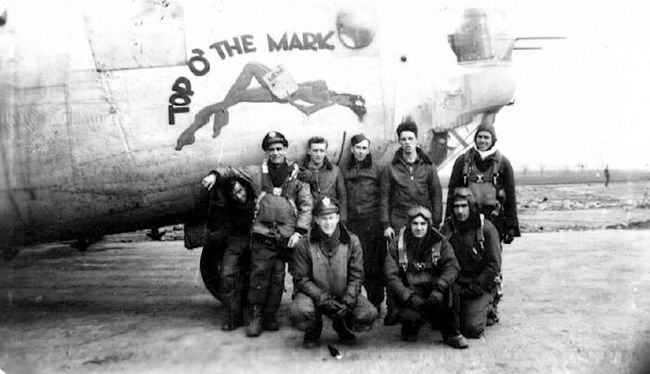 Their final combat flight was on March 22, 1945 to Kitzingen. 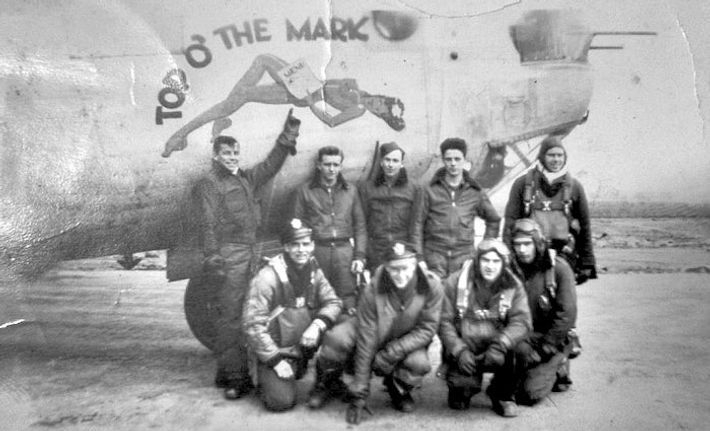 The majority of these missions (26) were flown in a B-24J named Top O’ The Mark. 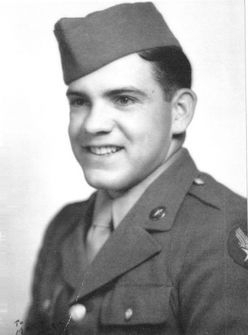 At some point in their tour, bombardier Roy C. Grasby, was possibly removed from the crew in order to perform navigation/bombardier (“bombigator”) duties on other crews. He is not shown on available load lists showing Grice’s crew, but he is shown flying as a navigator on the crew of 2Lt Kendrick E. Ferriell in late February. At the end of March, the remaining officers of the crew, and the two T/Sgt’s Frazier and Willingham, were transferred to the 32nd Ferry Squadron at Wharton in Lancashire for the purpose of ferrying aircraft. 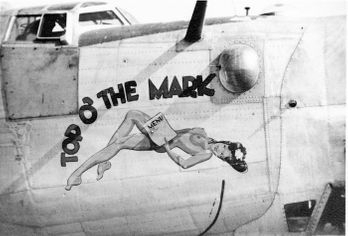 Top O' The Mark flew its first mission with the 458th on May 13, 1944. Almost one year later, on April 25, 1945 - the last day of the air war over Europe - it completed its 108th mission. The Grice crew flew 26 of their 36 missions in this aircraft. MIRE - In the service of his country in England, on October 7, 1944, SERGEANT EDWARD J. MIRE, beloved son of Judith Flacon and Edward L. Mire: brother of Lloyd and Robert Mire: aged 19 years; a native of Harvey, La. Remains arrived in New Orleans Thursday, July 29, 1948 at 9:30 o'clock a.m. via I. C. Railroad and will lie in state from 4 p.m. until service time. Relatives and friends of the family, also officers and members of David Walter Wiedman Post No. 64, American Legion, John McDonogh Post No. 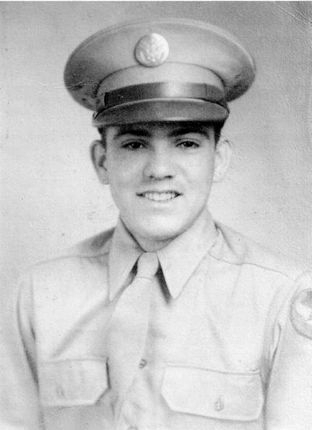 3121, VFW and other veterans organizations, also employees of the Celotex Corp. are respectfully invited to attend the funeral, which will take place Friday, July 30, 1948, at 9:30 o'clock a.m. from the Algiers funeral home of E. J. Mothe, 1300 Vallette street. Religious services at St. Joseph church. Internment in Hook and Ladder cemetery. "We Wish to express our sincere and heartfelt thanks to relatives, friends and neighbors for the kindness and sympathy shown us at the funeral of our beloved son and brother, SGT. 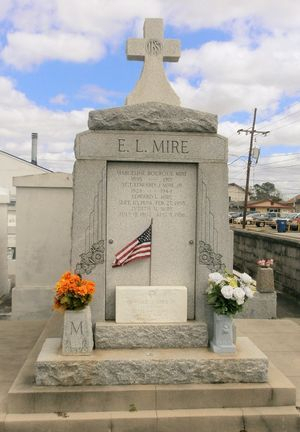 EDWARD J. MIRE. Special thanks to Rev. P. Daigle, assistant pastor of St. Joseph church, also to Mrs. John Romero, Mrs. Merlan / Pertuit and to Mothe funeral home. Many thanks for the beautiful floral offerings. All have our everlasting gratitude." Derick Grey holds the sign that will be placed next to a tree, planted to honor Sgt Mire, near the spot where the Liberator landed.